There is no greater satisfaction in knowing you've done your job well and served your clients' interests. So it means a lot to us when our clients take the time to acknowledge this by providing us with their testimonials. "Was good to work with and achieved the desired look." "My lounge/diner was in a desparate state and needed a new look. I contacted FMP and spoke to Costas - who was very patient as I could not decide what I wanted - he made up a sample board to help me. I was very surprised how tidy he was while working. My lounge/diner had been put on hold last year to illness, and I'm so glad I waited as I have a real room make over to such a high standard of workmanship. The venetian plastering is amazing - I was fascinated as I watched as he transformed a very tired room to a room that I can relax in and feels like home. Thank you - You will be back." "Costas was the ultimate professional from start to finish, meeting us with samples, listening to our requests and remaining totally unflappable when delays meant we had to reschedule him time and time again! 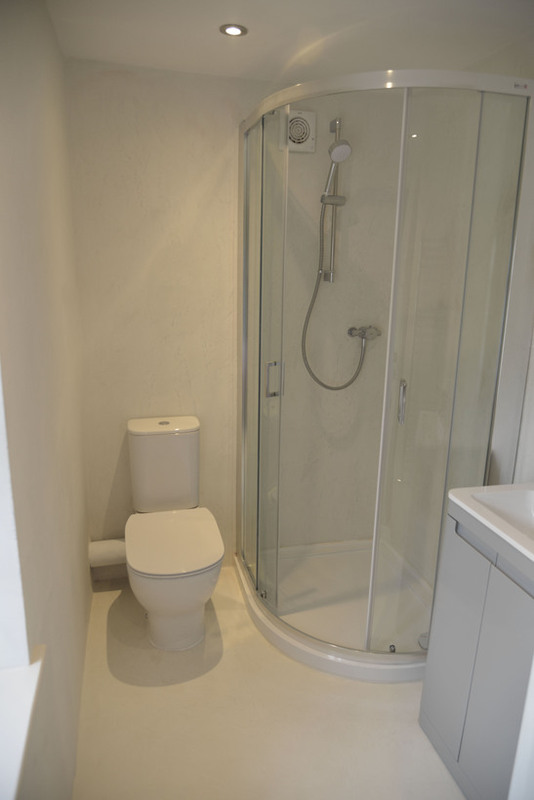 He left us with total confidence that he knew what we wanted and would complete our wet room to a super high spec, which, of course, he did. The cost for the job was very reasonable too in comparison to quotes we'd got elsewhere." "I saw some pictures of Costas' work on Facebook and was immediately taken by the variety of colours, textures and patterns I could choose. I spoke to Costas on the phone and described what I wanted, he was so very helpful and informative and not pushy at all. We arranged a meeting and he brought along some sample boards with him which were more impressive in real life than the pictures! After choosing the final design and colour Costas created a sample board and made sure I was happy with my decision. Costas is a very clean, neat and tidy worker. This was most impressive as it reduced the amount of stress that comes along with decorating! Throughout the whole process I was kept informed and if I had any questions Costas was more than happy to answer them for me. The end result I am so pleased with! It's a real talking point in my home and I love it! "Our front room has been completely transformed with a much needed makeover and it is even better than what we imagined! What we liked was that Costas gave the impression that he treated our home like it was his own because of his attention to detail. We are so pleased with the final result and would highly recommend him! Thank you Full Monty Plastering!" 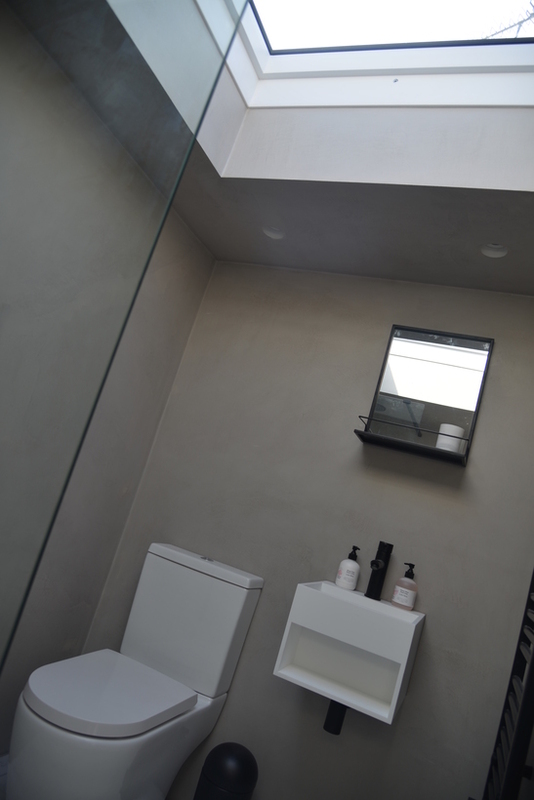 "Costas completed a polished concrete effect wet room for us in our new loft extension. Our brief may have been slightly unusual for the UK, having seen it abroad, however Costas was superb in meeting with us, discussing options and showing us a variety of samples. We ended up extending the finished surface to all walls, floor and ceiling for a consistent visual effect. 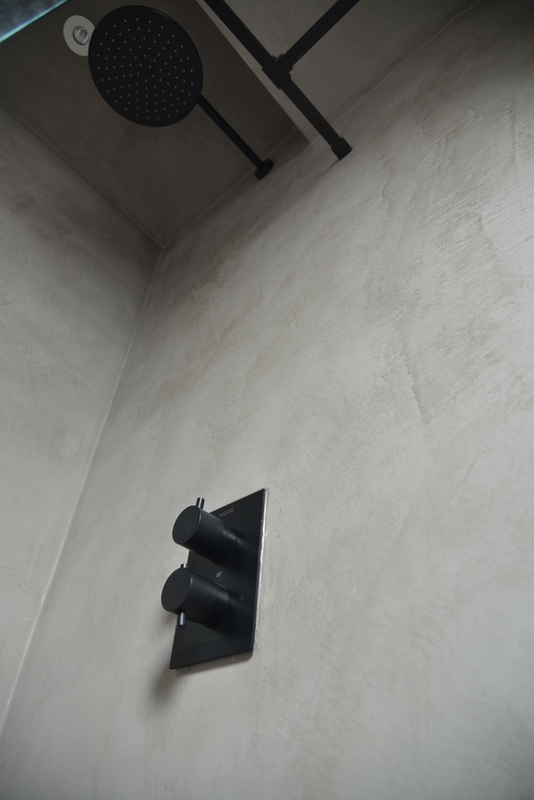 Now it has been waxed and the back bathroom fittings put in, the concrete effect is perfect and close to the real material. Highly recommend!" 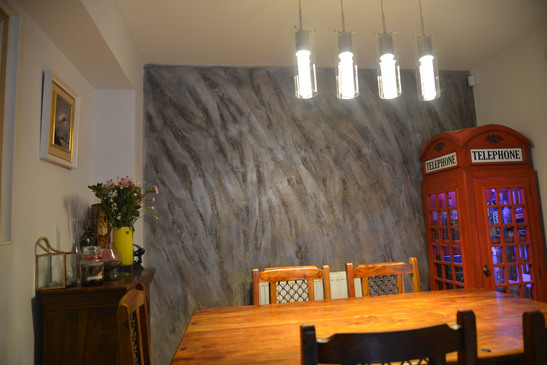 "Full Monty Plastering were given quite a difficult brief - 'Create a show stopping wall that ties in the new of our kitchen and the old of our restored quarry tile floor'. They could not have nailed it better. Expert advice was on hand and patience a plenty as we worked through sample boards until we hit the jackpot. Costas certainly knows his stuff, down to the fine detail like which powders would fit best without causing a scratched finish. Once we had agreed a finish (the sample board did not do justice to the finished product by the way), work started quickly, ensuring the surface was perfectly ready for our new statement wall. The team at FMP are punctual, reliable and most surprisingly for something you'd perhaps assume to be a messy jub, obsessively tidy. Our kitchen was probably cleaner during/after the work than it had started out! 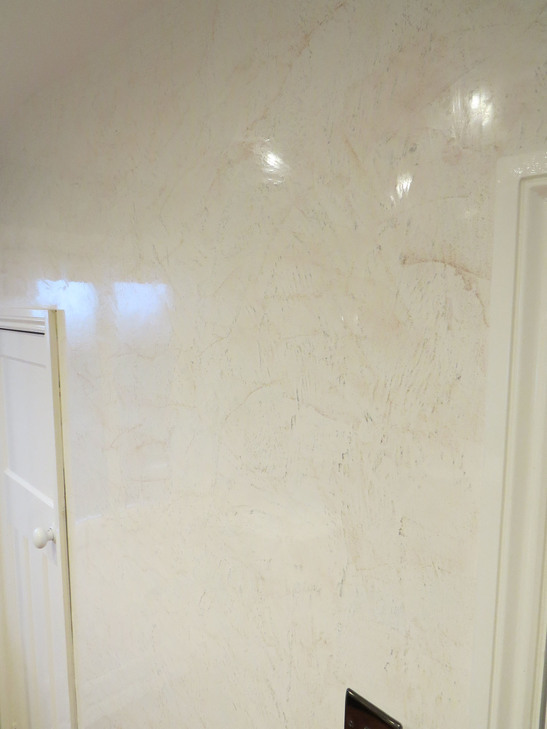 Without exception, every visitor to our house has been floored by the quality of finish and even more surprised when told it isn't actually a few tonnes of solid marble! I put that down to the painstaking processes the guys at FMP took so much pride in perfecting. The attention to detail during the waxing process for example wouldn't have looked out of place at a high end car detailer's workshop! 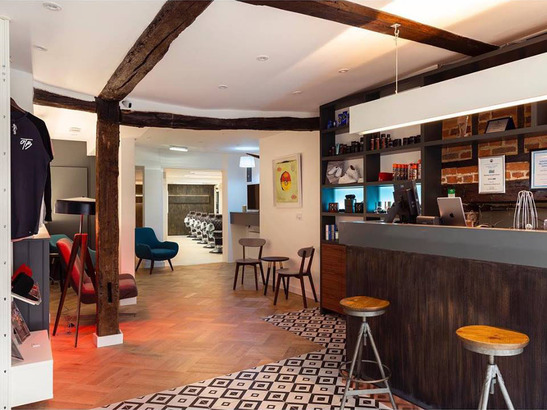 If you're looking for a wall or floor finish that will stop people in their tracks whilst being practical and easy to clean (not to mention deliciously cool in the warm summer months), then look no further than the team at FMP. If they haven't got something that you'd like, then there's probably no one out there that will have!" "We contacted Costas after seeing his work on the net. He talked us through the product and process. The designs are endless and bespoke. Once we knew what we wanted Costas made us a sample board so we could see the full effect. His workmanship is top class and very clean. 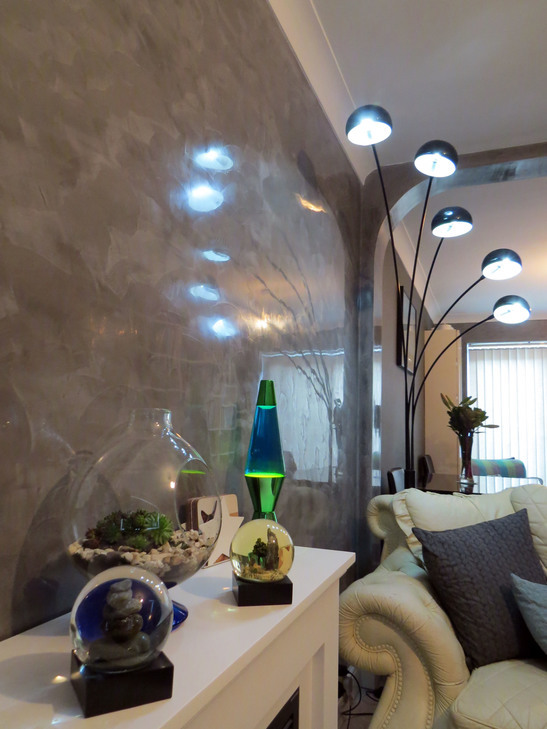 We are delighted with the end result and have had positive comments from friends and family who have seen our feature wall. We highly recommended Costas for his workmanship and professional attitude. We will be using Costas again." 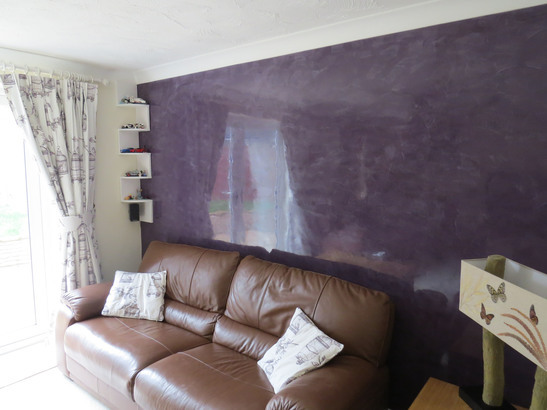 "Costas of Full Monty Plastering was an absolute pleasure to deal with and we couldn't be more happy with the results. He was really flexible and accommodated delays on our side with no issue, and was always on hand to help with any queries. 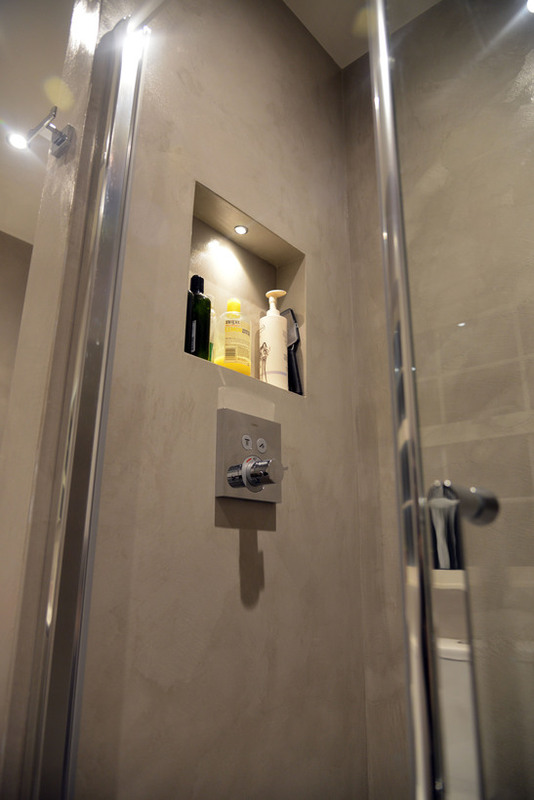 The final product is exactly what we wanted and is a great alternative to tiles." "Firstly, we are very pleased with our finished product. It is perfect for what we wanted which was an easy to clean, wipeable surface but, with style. It was a great pleasure to work with Costas, he always had the best interests for the customer and their needs. Costas was very flexible and took time out to really understand what the customer wanted and then helped us to achieve our goal. We also changed our mind whilst the work was being carried out and he was very supportive in helping us to achieve the view we were looking for. He was always accessible by either phone or email and if he wasn't then would always reply in a timely manner, this really enabled us to achieve our results efficiently and in a timely manner. 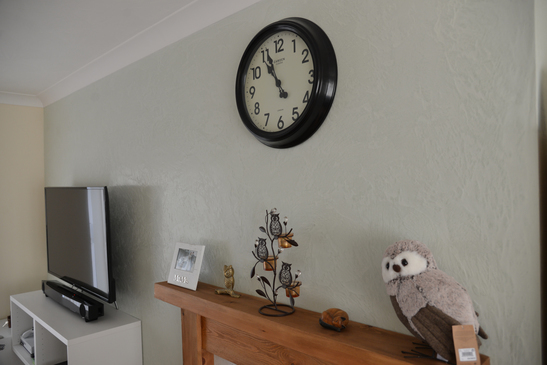 I would definitely recommend Full Monty Plastering in the future for both service and the finished product. "I can't rate Costas' work highly enough. 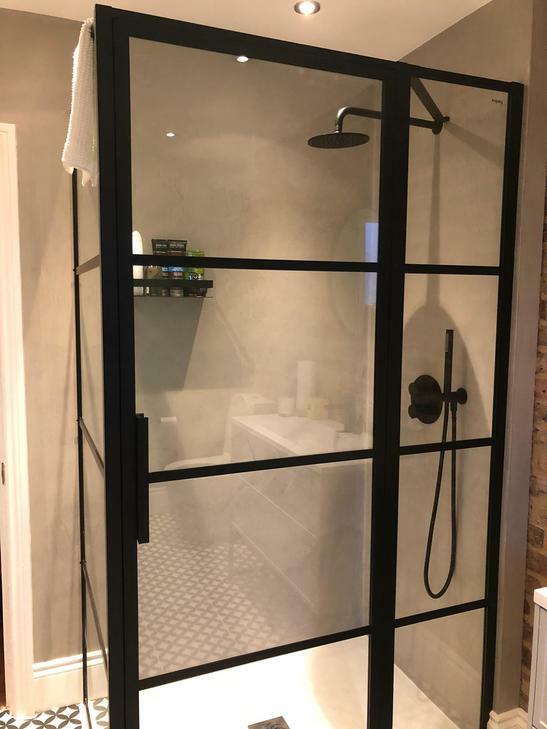 The job consisted of 2 bathrooms for a client - The look is really sleek and professional - no joins, no tiles, watertight, excellent and no lines to be seen! Great choice of colours - I went for a marbled white and the other in a marbled duck egg, but plain is also available. The bathrooms would have looked a lot smaller if I'd gone down the conventional tiled route. Thank you very much Costas."